The first BeeBCamp was about 14 months ago (here’s what it’s all about and here’s what happened at that first one). Today’s was the third such event, and opened up not only to more non-BBC guests than the previous one, but also to people who don’t happen to work in London. We had live video link-ups with Manchester and throughout the day, one of the tables in London had remote guests from The North virtually joining us at the end of the table. It was a great way of bringing the two locations together for fun, creativity and getting to know our colleagues and guests. These events serve to get people together from across the BBC (and beyond), build our networks, let us spend a day away from the normal work and think a bit differently about things. It’s not just the number of brain cells you’ve got; it’s the connections between them, and the strength of those connections, that makes intelligence and creativity possible. The metaphor applies to an organization like the BBC, with its thousands of employees in different fields. … Ideas and solutions that may be obvious to one team might be revolutionary to another. The trick is to get people together to talk about those ideas. Charlie Beckett wrote up Joanna Geary’s session on ‘moderating Comments: taming trolls and banning the bores‘ and Chris Thorpe’s on ‘mining value in the digital data dump‘. Andrew Bowden has blogged detailed notes about the sessions he attended. Philip Trippenbach wrote a wrap-up post summarising the day. I don’t often talk about work projects, but I cant hold my tongue about this one. I’ve been rather excited about it for a while, and it went live today. Adam Curtis is the documentary filmmaker behind ‘The Power of Nightmares‘, ‘The Century of the Self‘ and more. Recently, he’s done some pieces for Screenwipe about the rise and fall of the television journalist and another about ‘oh dearism’ in the news for Newswipe. Well, he’s going to start blogging about his work and ideas on the BBC. 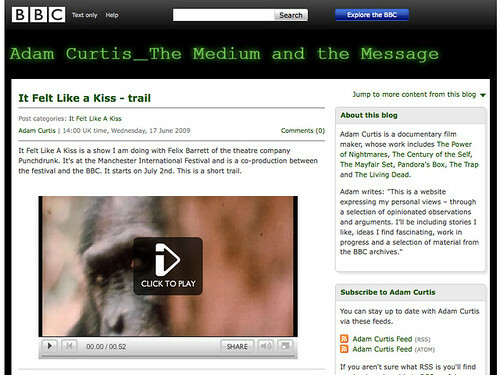 In fact, the Adam Curtis blog launched today at bbc.co.uk/blogs/adamcurtis. Hurrah. All rather exciting. Of course, the rights issues with some of the clips, and especially the music, make it hard to publish them all for an internet-wide audience and sadly some of the content has to be restricted to the UK for right reasons, but the plan is for as much as possible to be globally available as the blog goes forward. Mark Kermode (which has been around for a while, but I absolutely love the way he’s responding to comments). Series 5 of The Apprentice started on BBC One last night. Wondering what the web would be saying about it, I enjoyed the two-screen experience by watching the programme on TV while also looking down at a laptop on my lap with tabs open on Anna Pickard’s live blog on the Guardian, the Apprentice message board, and, of course, Twitter. With new updates appearing about as fast as I could read them, and sometimes faster, I turned to Twitterfall. Now it gets fun. Here’s a capture from early in the episode. By the end, it was updating at three times that speed. In fact, Twitscoop tells me that during the boardroom scene that forms the climax of the show, there were 300 updates per minute using the word ‘apprentice’. 5 messages per second is more than I can manage in real time, but I did spot some lovely gems in there. 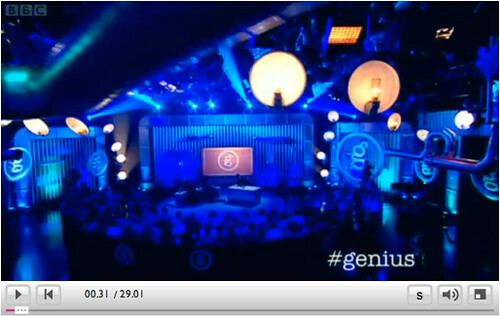 By the end of the show, 4 of the top ‘trending’ (e.g. 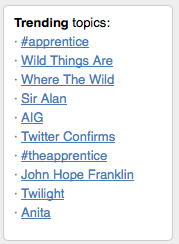 currently most popular) words and phrases, according to Twitter search, were apprentice, Sir Alan, theapprentice and Anita. The Apprentice was always going to be popular on Twitter, but I’m impressed at the scale here. Of course, most of the time you don’t care what everyone is saying about the Apprentice, just what your friends are saying. And that’s what Twitter’s good at. The ability to tap in to this real-time flood of info is pretty powerful though, even if it’s getting hard for one person to be able to even monitor it in real time. For the past seven months, Steve Bowbrick has been exploring the BBC from the inside. Last night, Nick Reynolds (Editor, internet blog) invited Steve to share his findings. He quickly rejected the commonly held notion that because the license fee paid for the BBC’s output it therefore it should all be freely available in all formats as “an unimaginative heat death for the economic value of the BBC”. “the BBC is not a business, it is a machine for the production of public value … Open organisations make more effecient use of resources … while businesses are typically good at concentrating capital and talent but inefficient at maximising public value. On the same day that the Guardian had announced their Open Platform Steve was concerned that Backstage, the BBC’s developer network, needs more love. 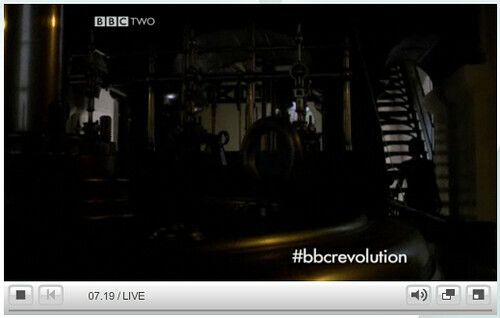 Steve concluded with some challenges, including the question of what to put at http://open.bbc.co.uk. It was lively, with some fascinating insights and opinions expressed. Emily Bell – The BBC is so big that it’s very easy for it to roll over in its sleep and kill a few people with its tail. Nick Reynolds – When there’s no consensus, we don’t want to talk about it at all. All big institutions avoid disagreeing in public. Steve – I’m also a school governor, and you’re told you have to be a critical friend. The BBC needs lots of critical friends. Tony, talking about middle management – the bit in the middle is the problem. It’s the bit that won’t thaw. But they’re also the ones who actually get fired, who get criticised and who get the blame for perceived failings. 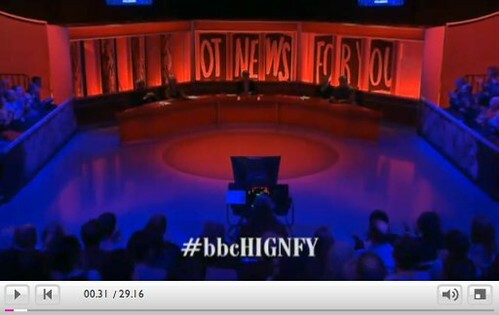 I was watching the openbbc tag on Twitter, as other people took live notes, so I noticed Tom Dolan when he expressed a view that “entertainment and comedy suffer really badly if you increase the openness”. And to underline his point, wondered whether “It’s time to start each episode of EastEnders with the doofdoofers, and then show that none of the sets join up in real life.”. Since Tom wasn’t in the room, I lobbed his point at the panel for him. Steve thought that the richness of just what’s in filing cabinets alone would make it worthwhile to do something. It doesn’t have to be everything. while Emily pointed out that it’s theatre – when you’re putting on a play you don’t want to see the guy putting the set together. Openness doesn’t mean you have to involve the audience at every point in the creative process. For what it’s worth, I agree with Emily. We’ve never involved ourselves in the DRM issue, which we should have done. 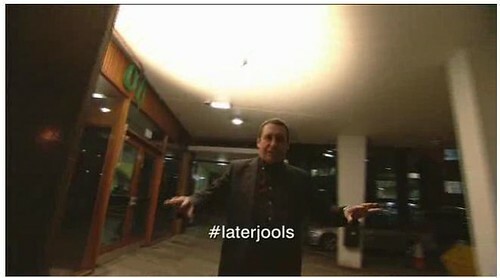 We don’t own much of the iPlayer code, but the bits we do own we should open. We don’t have significant contribution to the technical space which produces our media in the way that previous generations did. … Not just TV episodes. Content, information, millions of BBC Copyright still images, histories of localities … our brands could be made available for certain audiences in certain ways … all of which can allow self actualisation and stimulate a creative nation. A useful and thought-provoking session. 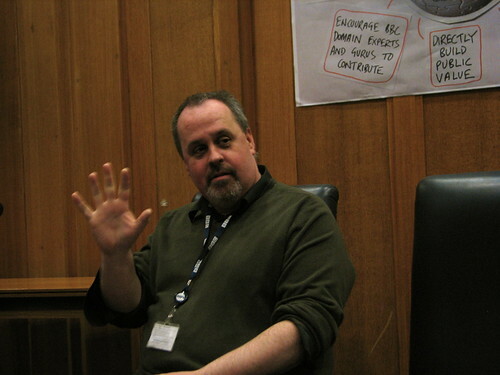 Steve recently wrote that the BBC should engage with Wikipedia. I agree. 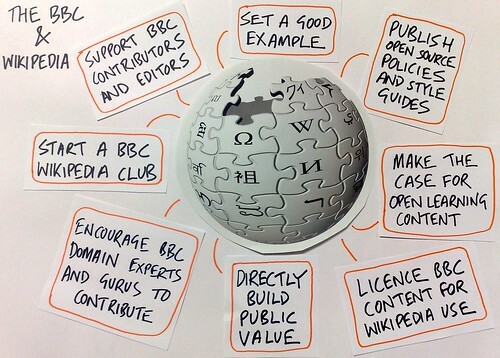 Here’s some advice for anyone at the BBC wanting to get involved, which includes some things to consider if you’re not already familiar with contributing to Wikipedia. Feel free to ignore it if you don’t work for the Beeb, but perhaps it will be interesting and useful to other people too and of course I’m keen to hear what (presumably many) important things I’ve missed. First of all, it’s worth knowing that the BBC has editorial guidelines about using open access online encyclopedias. “…When correcting errors about the BBC, we should be transparent about who we are. We should never remove criticism of the BBC. Instead, we should respond to legitimate criticism. We should not remove derogatory or offensive comments but must report them to the relevant administrators for them to take action. Once you’re comfortable with all of that, the next place to look is Wikipedia’s own documentation. A good places to being in the guide on contributing to Wikipedia, which says that although you do not have to create an account to edit articles on Wikipedia, there are many good reasons for you to do so. See especially the advice on why create an account. BBC employees should be open and transparent about their BBC status (which will be obvious from their IP addresses anyway, like this well publicised example) and the best way of doing this is by creating and using a user account. More good places to get started include the Five Pillars, avoiding common mistakes and the perfect article (although it’s worth remembering that perfection is not required). The policies and guidelines are important. Anyone considering editing Wikipedia you take their time in absorbing and understanding all the policies and guidelines. Here are some highlights. What follows it not a complete list, just a taster to get you started. You’ll want to be careful to follow Wikipedia’s policies and guidelines to ensure that any proposed edits, new pages or external links are worthy of inclusion, and always be open to correction from Wikipedia’s users and editors.